I love cornbread dressing, but this recipe adds a whole lot more yummy ingredients! Crawfish tails, crab meat and shrimp! First thing you do is bake the cornbread as directed per the package instructions. Don’t shut your oven off. Next, allow the cornbread to cool, and then crumble it with your hands into a large mixing bowl. Melt the butter in a large sauté pan (I’m thinking maybe a 14-incher), then add the onions, celery, and bell pepper, and simmer the mixture down until the onions clear. When all that’s done, drop in the hot sausage and add in the shrimp, the crawfish tails, and the crab claw meat. Toss completely, and cook the mixture for about 5 minutes, stirring often. Then add the milk and creamed corn, and stir until that mixture is fully blended. If at this point you notice that the casserole is a tad on the dry side, stir in about 1/2 cup rich chicken or seafood broth. Finish the casserole by folding all these ingredients into your bowl of crumbled-up cornbread. Fold in the beaten eggs, the shredded Cheddar cheese, and the minced Italian flat-leaf parsley. Season the mixture with either a little Frank Davis Sprinkling Spice or Tony Chachere’s Creole Seasoning to taste. Then transfer the concoction to an 11x14-inch baking dish and bake it at 350ºF for right about 45 minutes until deep golden brown. Enjoy any time you get a hankering for eating something good Chef’s note: If you can’t find Pioneer Cornbread Mix where you shop, then substitute the mix in your store that has the lowest sugar content. 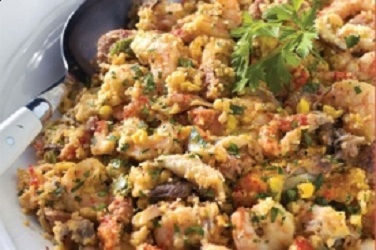 You don’t want this rich seafood-flavored casserole tasting overly sweet.